How Much Does Ballot Position Impact Philly Vote Totals? Everybody knows that a candidate's ballot position has an impact on his or her chances of being elected, but it's always been unclear exactly how large the effect is. 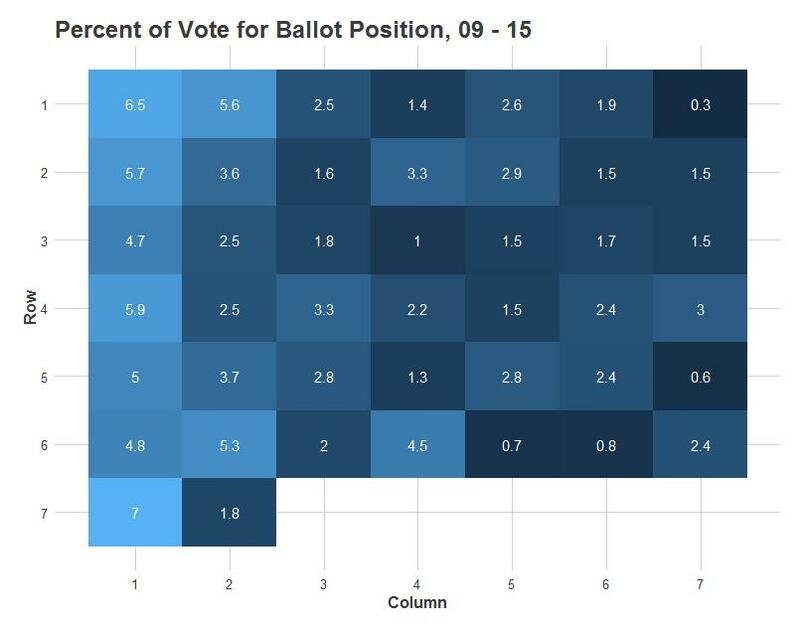 Now, Jonathan Tannen, the research director at Econsult Solutions, has a must-read blog post up taking a look at the impact of different variables on Court of Common Pleas election results from 2009-2015. 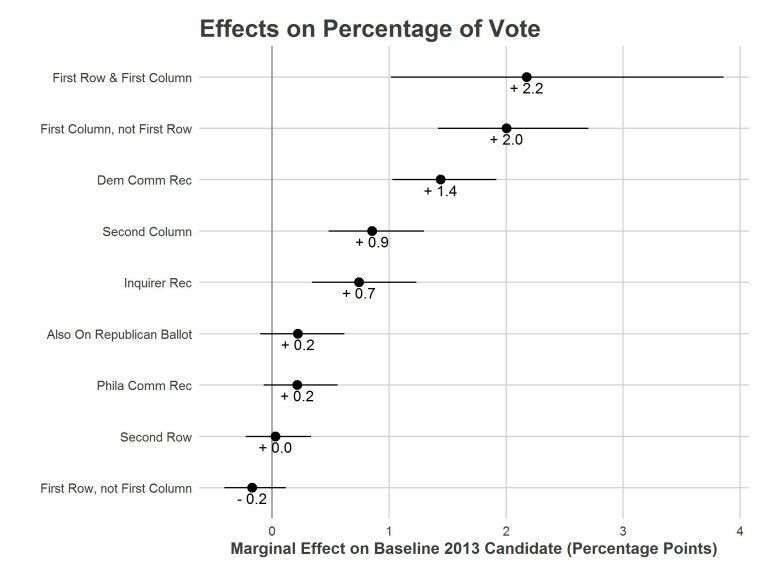 The ballot position effect is quite real, and it's much larger than the impact of actually-meaningful variables like endorsements. As Tannen explains, the basic problem with judicial elections (which is also a problem for other low-profile elected offices) is that voters tend to pay very little attention to them, but there are always lots of candidates to keep track of. Even hard-core political junkies don't do enough research to compare the 20+ candidates who end up running. Compounding the issue, judicial candidates can't make any policy promises, so the electorate is essentially flying blind when it comes to who the candidates are and what they'll do if elected. Voters inevitably take cognitive shortcuts. Highly regarded party and newspaper endorsements often sway voters. More vexing, perhaps, is another voter shortcut caused by ballot position. Ballot position is decided by a statewide lottery. Conventional wisdom around the city concludes that the candidate in the first ballot position — in 2015 Scott DiClaudio — is guaranteed the election. Indeed, in May 2015 Judge DiClaudio received the eighth most votes and is now serving on the Court, despite having been repeatedly and publicly censured for his poor performance as an attorney. How much is a good ballot position worth? Quite a lot. Winning a position in the first column is as good as winning the election. Getting randomly assigned to the first ballot column is far and away the most impactful thing one can do to win a seat on the Court of Common Pleas, followed by winning the Democratic Party's endorsement. Bar Association recommendations carry almost no weight, and interestingly, being on the first row adds almost no value either. As Tannen puts it, "[w]e have a system in which the luck of being the first name pulled out of a coffee can (Yes, a coffee can) is worth as much as the endorsements of the city’s dominant political party and the city’s most influential newspaper combined." This, obviously, is not a good way to hire anyone to do anything, let alone some of the city's most important jobs.